It is not just for me. I contacted Verisign support (excellent response, by the way), and my contact there also cannot log in. This has been going on (for me anyway) since the morning of Wed, May 2nd. Of course, now I find I should have an alternate login already setup: http://blog.stackoverflow.com/2009/01/we-now-support-multiple-openids/. I'm going to request a merge of this account with my old one, though I suspect I'll need to log into the old one at some point, with Verisign. The problem was related to our internal DNS servers inside the network. Windows 2008 R2 has a penchant for sending EDNS probes, and some firewalls/servers don't like transmitting/processing them. I've disabled EDNS Probes from the dns servers and tested with my own verisign PIP, and it now works. I saw a number of emails about this over the last couple of days. Given the volume of them, I have passed along this information to our head of core development, Jarrod. He has assured me that the development team is working on it. I'll update this answer when I receive word that this issue has been resolved. We thank you all for your patience, and we apologize for the inconvenience. Users who create a "dummy" new account in order to continue participating on the site are free to request a merging of this dummy account into their main account by emailing team@stackexchange.com. If you email us requesting a merger, please include links to both profiles. Again, thank you all for your patience, and we hope this will be resolved shortly. [EDIT] I was recently made aware that this is an issue on the system administrator side, so it will take a bit longer than expected to resolve. (By this, I mean, likely unresolved until Friday morning New York City time.) Again, we thank you all for your patience and assure you that this is getting taken care of as expeditiously as possible. I prefer VeriSign PIP to other openID's due to the VIP Access security code app for my phone. This provides a very secure way of logging into any of the sites where I use this. For StackOverflow this security is not as important, but it is still nice to use one primary openID. 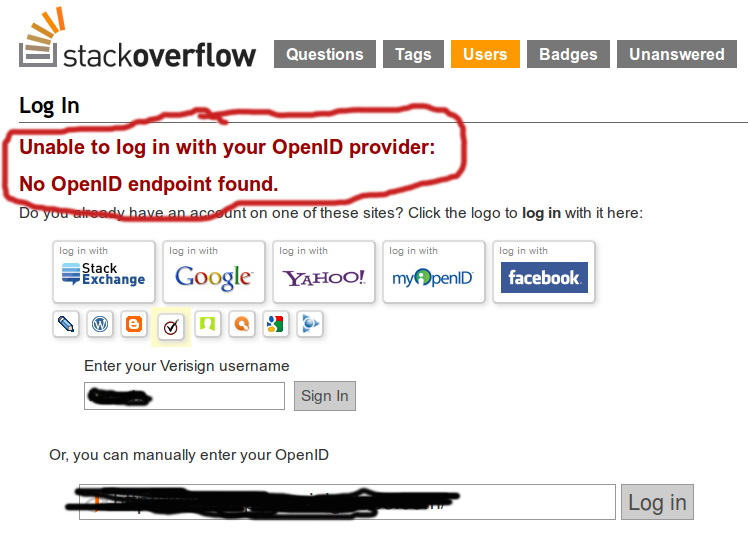 The stackoverflow.com server is unable to find our OpenID endpoint for some reason. We were able to log in using a delegated OpenID, but logins directly to the PIP are not going beyond the discovery stage. Logins to an directed identity get as far as the PIP but are rejected back at stackoverflow.com with same the bad endpoint error message. There is nothing in the logs to indicate an error on our end. In fact, I'm not seeing anything from stackoverflow.com at all when we click on the login button. Logins to other RPs continue to work correctly. If we're going to fix this we'll have to get in touch with the stackoverflow.com people to find out what they're seeing on their end. I am sure that StackOverflow will fix this issue asap. Regardless the VeriSign PIP still works on other sites. Not the answer you're looking for? Browse other questions tagged support openid login . Google OpenID (alt) failed to work: Were profile URLs migrated? I've lost my original OpenID login, how do I get it back?